A tract of wetlands have developed into a wonderful city with all modern civic amenities because of the initiative taken by a leading realty, speakers said as Bashundhara Abason Mela-2012 got off to a festive start in the capital’s Bashundhara residential area Sunday. Sadat Sobhan, co-chairman of the country’s leading business conglomerate Bashundhara Group, formally inaugurated the fair around 11:00am at Bashundhara Group corporate office. East West Property Development (Pvt) Ltd, a sister-concern of Bashundhara Group, has organised the 45-day housing fair with the slogan “Reside in Green”. The fair will continue till November 30. The housing fair will remain open every day between 9:30am and 5:30pm till November 30. However, the fair will remain closed on the day of Eid-ul-Azha, said the organisers. Among others, Chief advisor to Bashundhara Group Chairman Mahaboob Morshed Hassan, Senior Deputy Managing Director Muhammad Belayet Hossain, Deputy Managing Director Mustafizur Rahman, Advisor (Press and Media) Mohammad Abu Tayeb, Advisor Khondakar Mizanur Rahman, Senior Executive Director (Admin and HR) of East West Media Group Limited Brig Gen (retd) Ahmed Muktadir Arif, Senior Executive Director (Land) Liakat Hossain, Senior Executive Director (Sales and Marketing) Bidyut Kumar Bhowmik and other high officials were present at the inaugural ceremony. Bashundhara Group gives priority to the demand and necessity of people besides doing business, he said. The organisers said the fair will be continued in more two places alongside including Bashundhara City Shopping Mall (Level-11) and Bashundhara Riverview Site office which is adjacent to Bangladesh-China Friendship Bridge (Buriganga Bridge-1). A large number of interested people, including wage-earners and Non-resident Bangladeshis (NRB), are expected to visit the fair to make their choice, they said. The organisers declared special offers for making any booking of plots or flats during the fair. Bashundhara Group has offered Tk 5 lakh discount on each Katha of land on the occasion. Under the project, Bashundhara Group will sell plots of different size, including 3, 5, 10 and 20 kathas of land, on its “P block”. Deducting the discount price, the price of each katha stands at Tk 16 lakh. The booking money is Tk 2 lakh and one will get a LED Television and a laptop free of cost by making a spot booking. Of the persons who will make a booking during the fair, one will win a brand-new car through lottery process, added the organisers. During the inaugural programme, Mohammad Abu Tayeb said Bashundhara Group in their housing sector gives priority to ensuring facilities for people. “Bashundhara has planned to create residential arrangement for one million people. People’s interest in buying land is increasing day by day. The Group is offering plots and flats which is affordable for middle-class people besides upper-class,” he said. 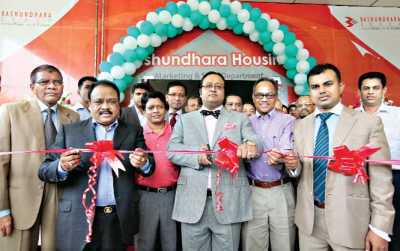 “We expect a good response from the clients during the fair as Bashundhara earned a good reputation from people for its housing sector business,” he said. The group also earned the faith of Non-resident Bangladeshis (NRB) as a large number of NRB are buying plots and flats from the group, he said.